November 22, 1963 is remembered as a turning point in the lives of Baby Boomers who grew up in the 1950s and 1960s. Young, vital John F. Kennedy, the first US President to be born in the twentieth century, was suddenly struck down by an assassin’s bullet and nothing ever after seemed the same. I was eleven years old and in the sixth grade at Maple Leaf School in Seattle. 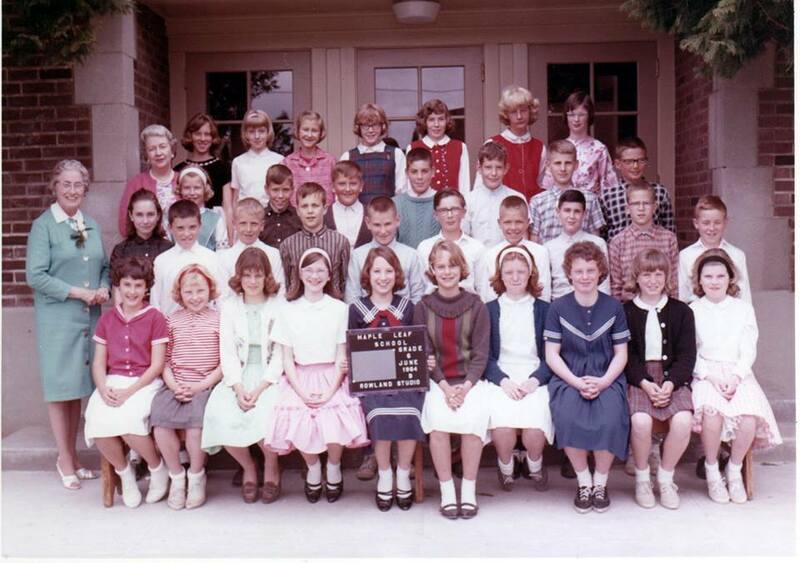 I started out my grade school years at Wedgwood Elementary through fourth grade in 1962. Then my parents decided to move to Kent, about 25 miles south of Seattle. My father’s employer had transferred him to Kent but only a year later Dad was able to get another position back in Seattle, and we moved again. Mom was happy to return to long-time associations in the Wedgwood neighborhood of northeast Seattle. My parents looked for a house to rent in Wedgwood if possible, but the one they found was “over the line” into the next elementary school boundary a few blocks to the north. For that school year, 1963-1964, I attended Maple Leaf School which was located on NE 100th Street at the northeast corner of 32nd Ave NE. In those days elementary schools went through sixth grade and then our class went on to grades seven through nine at Jane Addams Junior High. Maple Leaf School Sixth Grade, June 1964. Teacher Miss Jane Dayton (in blue) and Principal Katherine Maxwell (pink.) Valarie is in the back row, far right end. Photo courtesy of Philip Cereghino. Whenever our class members misbehaved, our sixth grade teacher at Maple Leaf, Miss Jane Dayton, admonished us that she was “trying to get us ready for junior high school.” She was nearing retirement age and with the perspective of a long-time teacher, she often encouraged us that we would have a good future if we would apply ourselves to our studies. Family heirloom: 1890s rocking chair. I remember Miss Dayton as a dedicated teacher who combined class instruction with individual attention. She gave extra credit for written work such as book reports and essays, and it was her encouragement of my writings which launched my “historical” hobby. I began writing down family stories told to me by elderly relatives, such as the tale of a child’s rocking chair handed down in our family. The little chair was the only surviving object after a house fire in the 1890s at the home of my great-grandparents on a wheat farm in Helix, Oregon. Miss Dayton had me read my rocking-chair essay aloud to the class. Then she led a discussion about family history and what we might learn from asking questions of our grandparents and other family members. At age eleven in the sixth grade, I’d had no experience with death and perhaps for that reason I particularly remember how Miss Dayton handled the events of November 22, 1963. The school principal, Mrs. Katherine Maxwell, came into the classroom, somber-faced and without greeting, and handed Miss Dayton a note. Mrs. Maxwell had been principal of View Ridge Elementary until 1956. She came out of retirement and was principal at Maple Leaf from 1959 until her second and final retirement in June 1968. Miss Dayton did not conceal her emotion as she told us that the President of the United States had been shot, and she then said, “I know I’m not supposed to, but….” as she asked us to bow our heads for a moment of silent prayer. I vaguely remembered having heard something about prayer no longer being allowed in public schools. What seemed like only a few minutes later, Mrs. Maxwell returned with a second note and Miss Dayton sadly announced that President John F. Kennedy was dead. For us as sixth graders, Kennedy was the first United States president whom we were aware of, and we had felt that he was “ours.” Our world view widened at that moment to include events and catastrophes which could impact us beyond school, home and local community. We began to realize that things were changing, as we would leave elementary school at the end of that year and continue growing up. I began hearkening back to neighborhood memories in September 1991, when I escorted my daughter Amanda into the same kindergarten classroom at Wedgwood School where I had also attended. There was even one teacher still at Wedgwood who had been there during my own early grade school years. During that 1991-1992 school year I became involved in a Wedgwood School PTA project to bring local history into the classrooms. Then the editor of the Wedgwood neighborhood newsletter heard about the project, and asked me to share what were learning by writing articles about the history of the Wedgwood community. 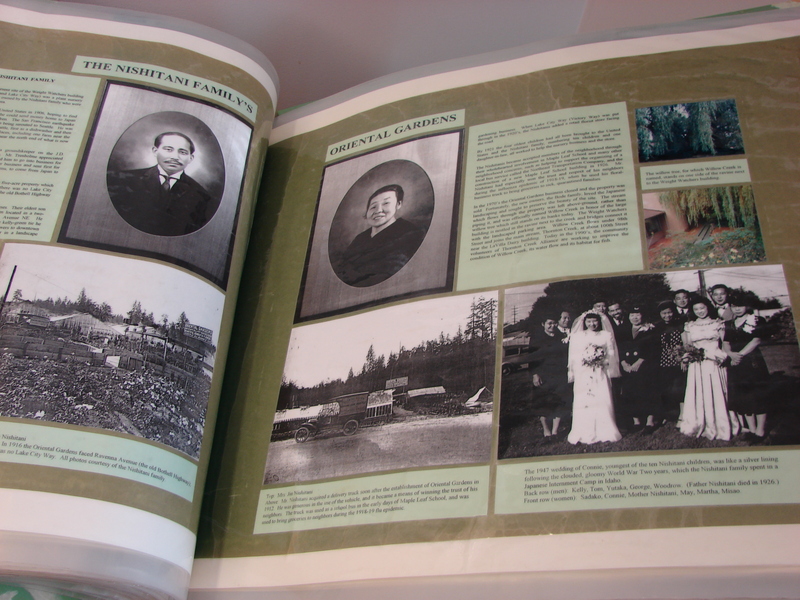 A page from Meadowbrook history: the display book at the Meadowbrook Community Center. After getting started in 1992 with writing about Wedgwood, in 1993 I began writing about Meadowbrook neighborhood history. Plans had begun for a new Parks Department community center at 10517 35th Ave NE, adjacent to the swimming pool building. As with all municipal projects in Seattle, there was a budget designation of “1% for art.” In addition to art pieces which the team of artists made for the new building, I took the commission to gather local history, designated for me to complete in a prescribed format, a large scrapbook-style display book. The book, completed for the opening of Meadowbrook Community Center in January 1997, is on permanent display in the building lobby. Now most of the stories from the book have been posted here on this blog under the Meadowbrook category. The letters of the 1930 addition to the Maple Leaf School building have been preserved by placing them inside the back cover of the display book at the community center. Photo courtesy of Michael Houston. During the 1990s the neighborhood name of “Meadowbrook” gradually came into greater use, in part because the old Maple Leaf school building was closed. The older generation had considered Maple Leaf School the name identifier and centerpoint of the neighborhood. They were sad to see the Maple Leaf school building closed in 1979, no longer used, and then eventually torn down. 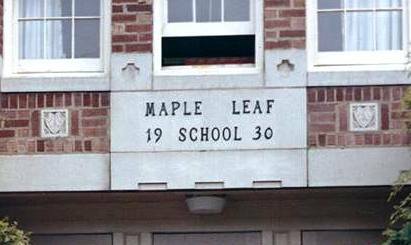 During demolition, neighborhood residents took away the concrete keystone block with brass letters “Maple Leaf School 1930” which had marked the addition to the 1926 building. When I gathered Meadowbrook history stories for the display book, these letters were given to me. The brass letters are affixed to the inside back cover of the display book in the lobby of the Meadowbrook Community Center. By including articles about Maple Leaf School here on this blog, I have tried to honor the legacy of that school community. Additionally graduates of Maple Leaf School have continued sharing of community on Facebook. The house at 10049 35th Ave NE as it looked when new in 1954-55. The writing on the photo is the King County Tax Assessors property description. The house was remodelled in 1990 and a second floor was added. Ironically the house which my parents had rented in 1963-1964 later became the flash point which caused the formation of the Meadowbrook Community Council. In 1990 the house at 10049 35th Ave NE was bought by Compass Housing to be used as a group home. The house was remodeled and a second floor added for more bedrooms. Nearby residents wondered if this multiple-residence was legal and if the occupants would be good neighbors. A young attorney accessed the process to link up with the City of Seattle’s Department of Neighborhoods and form a community council for Meadowbrook, as a forum for concerns first brought up about the group home. It was at that time in the 1990s that the name “Meadowbrook” began to come into greater use, as intended for a sense of neighborhood identity. Today the Meadowbrook Community Council is going strong with lively, well-attended meetings and multiple activities. In the beginning years of writing about neighborhood history Valarie interviewed elderly residents. Looking back more than fifty years to the events of November 22, 1963, I can see how the sense of loss on that day caused me to value friends, family and community even more. I began to develop a “historical sense” of how our national and local heritage influences us. In the 1990s my own family background and my interaction with neighbors led to my community involvement including interviews with long-time Wedgwood and Meadowbrook residents. The Meadowbrook Community Center opened on January 11, 1997.
and loved ones now in glory. for us to care for here. they cleared and farmed the land. has passed down hand to hand. there’s always more to tell. this story’s been told well. with pride in our new hall. This entry was posted in Events and holidays, Meadowbrook neighborhood, School histories and tagged Maple Leaf School, Meadowbrook Community Center, Neighborhood History, school memories, Seattle. Bookmark the permalink. What wonderfully rich post, Valarie. Some of my fondest memories of life were during my grade school days at Arbor Heights. I remember that fateful day in November, too. So somber and kind of incomprehensible to my 6th grade mind. A turning point for our country that, I think, took away our hope and inspiration from which we have never recovered. Thank you, Fred. I agree that the day of President Kennedy’s death was a turning point in our young lives when we were no longer sheltered from tragedy. At the same time, that one year I spent at the Maple Leaf School, paid dividends decades later when I was able to connect with the community of folks who cared so much about their school and neighborhood.